To Carry: To support or bear the weight of, to hold or support, in a certain way. CARRYING: Carrying prolongs a horse's usefulness, and will enhance all performance endeavors; this in not just for the Dressage horse. Educating a horse how to carry is not difficult, and is a skill I've taught many young riders, as well as adults, how to do. A horse is "carrying" when the ligamentous system of its back and neck is involved to support the rider. This frees the long back muscles to propel the horse forward. A horse moving in this manner is considered "engaged." Engagement leads to lightness of the forehand! Because it is unnatural for horses to bear the burden of rider's weight, at least we can educate them how to be as strong as possible when being ridden or driven. The ability to carry is necessary for the longevity of our beloved horses. A horse that actively engages its ligamentous system to hold up the weight of the rider, is not only stronger, but also a softer, more supple and comfortable ride; overall a more happy, and more healthy animal. A horse educated in how to carry will stay sound longer. Guidelines to evaluate if your horse is carrying are further below in bold. Please read. Photo of Cassandra Snyder and Flairadees Gizmo. Greater schooling than may be necessary for a trail horse is displayed by this 5 yr old Anglo-Arabian mare. A dynamite performance effort: lifting and holding the rider (carrying) and using the strength of her long back muscles to propel herself (pushing power) with great power. Dressage riders are familiar with carrying as goal, but it is a goal worthy of all horseback riders. I begin educating the horse to carry during the 'initiation to under saddle work.' Right from the start, if a horse is taught how to carry, the horse's anxiety level drops because he does not feel compromised, burdened, or clumsy with the additional weight of the rider. Instead, the horse can utilize their natural carrying capacity; the capacity to carry the heavy burden of its abdominal contents. This is what we are engaging: the ligaments of the back and neck. 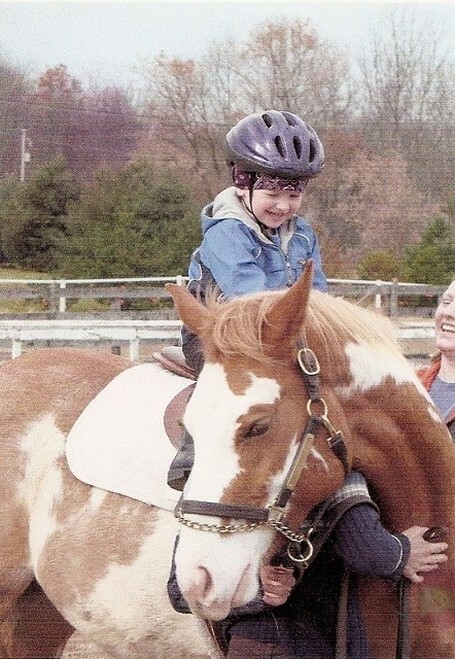 Notice in all photos on this page, the area behind the saddle is lifted and strong. 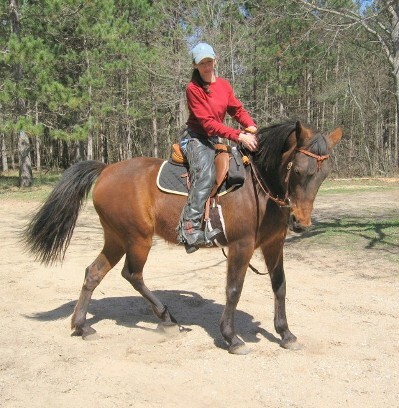 Photo below: Tennessee Walker mare used for trail riding. She learns to carry too. Photo of Cassandra Snyder and Tennessee Tess. It is never to late to teach a horse; this mare was ten, with anxiety issues. First we formed a bond with The Sacred Language, then I taught her to carry. The pain from hollowing out her back went away, as did her anxiety! When most horses are started under saddle, they are taught to tolerate being sat on, to stop, to go, and to steer. This approach starts the physical decline of the horse's body. As most horses will tolerate "being sat upon," this often is as far as many horse's education goes. Their back drops down under the burden of rider and painful saddle. This posture leads to many traumatic changes in the horse's body: spinal pain, muscle spasm, anxiety, joint degeneration in the front limbs, sacro-iliac strain.... A horse's first instinct is to drop its back under weight, so we owe it to our horses to become educated in how to ride them in a manner which teaches them to carry. You will be rewarded with years more use out of your horse! It isn't an arched neck we are after; that is a facade, or fake appearance, of carrying. Most of the time, when a rider prioritizes arching the neck of the horse, the back becomes even more hollowed out. Too often riders try to force the nose in for this "look alike" of collection. Forcing the horse's nose in towards its chest causes more problems than if they had left the horse's head in a natural position. Carrying does not mean having the neck arched. Carrying is the educated approach of engaging the ligaments of the horse's back and neck to support the weight of saddle and rider, for the sake of giving your horse a better life. Photo of racing mare in morning training, below, shows the horse's neck need not be arched for the horse to be carrying. She meets all criteria for carrying, and she is powerful! 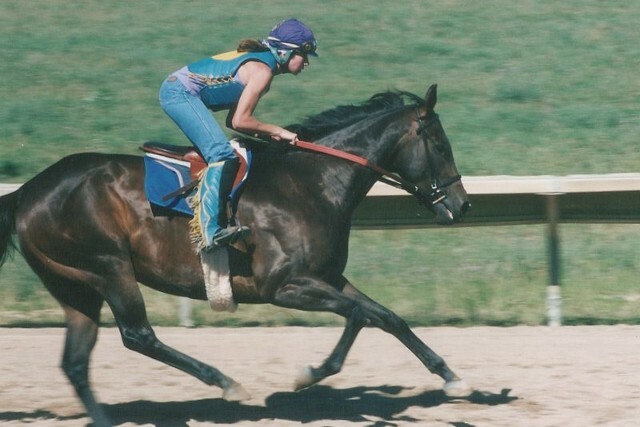 Photo of racing mare in morning training and Cassandra Snyder. The white saddle pad above is the racing model of a Saddleright™ pad. These orthopedic pads prevent pain and cellular death under saddles. All photos on this website, have a Saddleright™ pad in use. Cassandra Snyder is a distributor. Please call/email for details and to order. 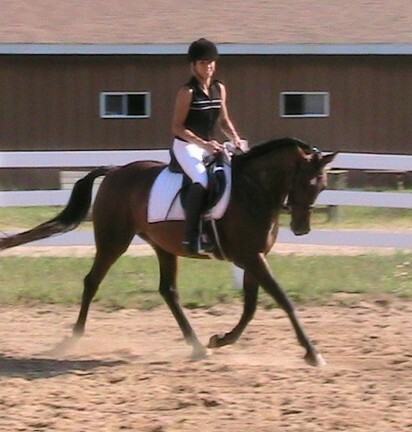 Cassandra Snyder and Flairadees Gizmo in a Dressage competition, Training Level. In the show ring, a horse that is carrying commands attention! The proper engagement for Dressage comes from this type of training. The proper bascule for jumping comes from this type of training. The proper slide of a reining horse, and the nimbleness of forehand in a working cow horse, comes from carrying. A comfortable ride comes from this type of training. Carrying is the foundation for the horse's quality of life and longevity when under saddle. How I achieve carrying power: Relaxation must first be achieved. Carrying cannot exist with tension. Due to relaxation, the subsequent lowering and lifting of the horse's head/poll begins the process of strengthening and activating both the nuchal and supraspinous ligaments. NOT with draw reins, gag bits, German martingales... These do NOT facilitate carrying. They over strain and over stretch these ligaments subjecting them to tears and weakening! An understanding of the bio-mechanics of the horse must be present for a trainer to help you. When I read a trainer's blog, and he said, "Well all that stuff about the poll being the highest point is just too technical for my students, we just want to get the horse's head out of the rider's lap...." He just admitted to his ignorance of the very subject he makes his living with. He admitted to potentially harming his clients horses as he touted the use of German martingales for getting the nose in to the chest. These are forceful, frightening tools used to overpower a a tense horse. These tools tear tissue, whether used harshly or lightly. Please read the page titled A Learning Story, for more details on the horse's back and ligaments and the destructive power of 'training' gadgetry when used on horses. Ignorance is not bliss when it comes to horses. Ignorance harms horses. Please seek someone knowledgeable in the functional anatomy of a horse to help you with your training. This is one of the reasons I have gone into such detail to educate in my website. I want for viewers to contact me to help their horses have a quality of life; to know what a quality life for a horse is. 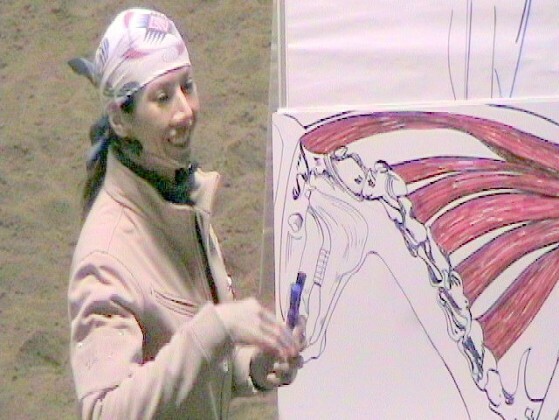 Photo below of Cassandra educating during her clinic titled: The Functional Anatomy of the Horses' Back. Following was a riding exhibit of how to teach a horse to carry. Cassandra is available for clinics on numerous wellness and training topics. Below is another example of carrying. While no technical criteria need be evaluated; it is undeniable, the horse is carrying...with love, a bundle of love! Photo of Jag, a Paint horse, and one of my valuable assistants! Horses carry our hearts and dreams, let us help them carry our weight. See results with your horse; C. Snyder's Way.